A debris loader is invaluable when you need to load fall leaves for disposal, but it can be hard finding something that’s the right size for your needs: small loaders are easy to use but are slow and can clog easily, while large loaders aren’t as flexible and can be pricey. Echo Bear Cat’s DL10 debris loader covers all the bases by being small enough to be hand-carried or mounted on a hitch receiver while using innovative design feature to make the most of its available power. At 340 lbs, this machine is no lightweight, but high-mounted handles make it possible to move the loader and position it for mounting without needing a forklift. Debris enters through a 12-foot intake hose capped with an aluminum nozzle with two handles, one for each hand. That puts less weight on the operator and offers more hand position options for reduced fatigue. 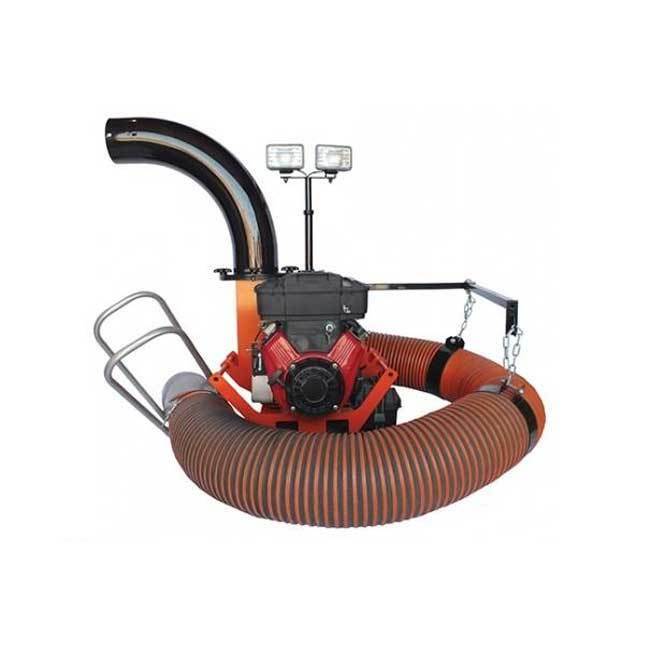 The boom has a central swiveling joint and supports the hose with two chains, leaving less weight to lug around while reducing hose angles to preventing clogs. While other brands may offer an adjustable chute as an upgrade, the DL10 comes with a 360-degree swiveling discharge tube straight from the factory. This lets you get just the right position when loading debris and move the chute out of the way during transport. The DL10 is powered by a 570cc Vanguard V-Twin. It comes with an electric starter and a pull start back up, as well as the features you expect in a commercial engine like full pressure lubrication and a heavy-duty air cleaner. This engine drives a 16-inch impeller with four serrated blades. These blades chop up leaves as they pass through the chamber, reducing their size so you can carry more debris with each load. A replaceable liner takes the brunt of the wear, protecting the impeller case for a longer service life. Maximum suction power for this unit is 3,900 CFM. Using the right combination of parts, you can get debris into any container. 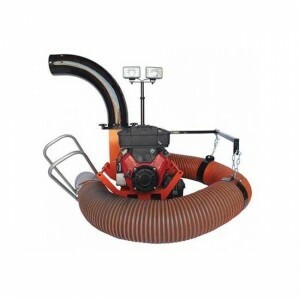 There’s a 16-inch vertical chute extension for reaching over tall beds, a four-foot flexible horizontal chute extension to drop debris directly into your truck or trailer, and a deflector cap that aims debris right where you need it. From the factory, the loader is designed to be permanently bolted onto a flat surface, but it can also be attached to the rear of your truck as needed using the receiver mount kit. Worried about shorter days cutting into your work time? The 12-volt work light runs off of the engine’s electrical system, shining light toward the rear of the loader to give you more time to wrap up the last job. The Vanguard engine is covered by Briggs & Stratton for three years of residential or consumer use. The rest of the DL 10 is guaranteed by Echo Bear Cat for three years of residential use, one year of commercial use or three months of rental use. When you’re looking to add some equipment or have your current machines serviced, visit Shank’s Lawn Equipment. We’re an Echo Bear Cat Signature Elite dealer, which means we’re one of the top dealerships in the country, offering the service and support you need to get the most from your equipment. Visit our shop at 4900 Molly Pitcher Highway in Chambersburg, PA. That’s one mile east of Interstate 81 via Exit 10 to Marion. We can also ship the parts and accessories you need for your loader to any address in the U.S. or Canada. To order, visit us online at www.shankslawn.com. This entry was posted in Uncategorized and tagged Debris Loader, DL10, Echo Bear Cat DL 10 Debris Loader. Bookmark the permalink.